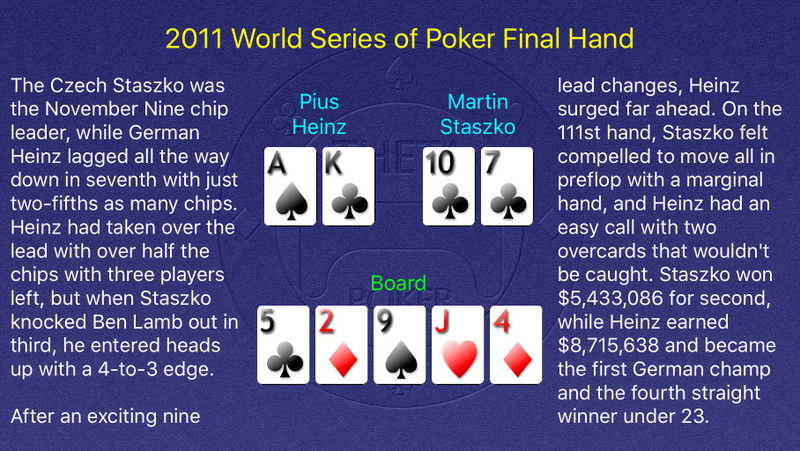 Heinz final tabled the $1,500 No Limit Hold ‘Em event earlier in the 2011 WSOP for $83,286 and has three cashes, all in No Limit Hold ‘Em, since then. 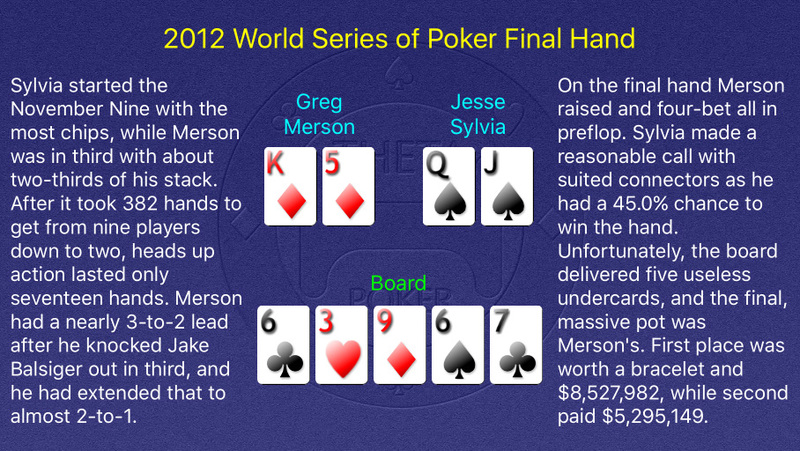 The Main Event was Staszko’s fifth cash of the 2011 World Series of Poker. He has cashed multiple times every year since. 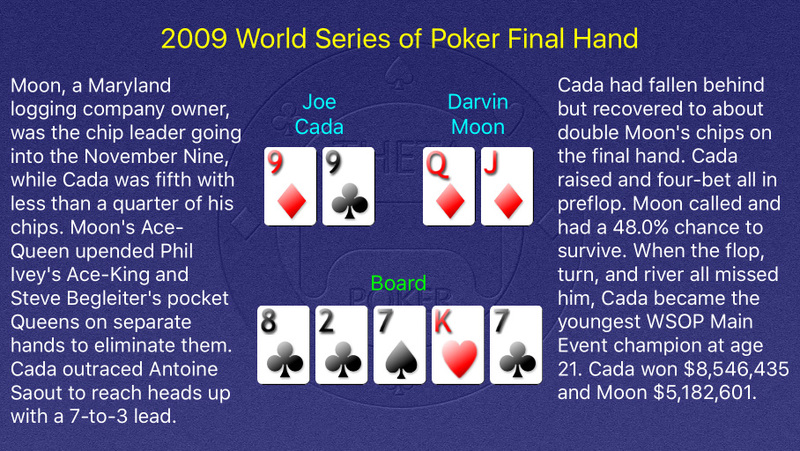 Cada won his second WSOP bracelet and $670,041 in a 2014 $10,000 No Limit Texas Hold ‘Em Six Handed event. Moon has relegated most of his poker activities to the Heartland Poker Tour, where he has served as a Tour Ambassador and had three small cashes. To generate more excitement for the World Series of Poker Main Event’s final table, the tournament was put on hold when Dean Hamrick busted out in tenth place. 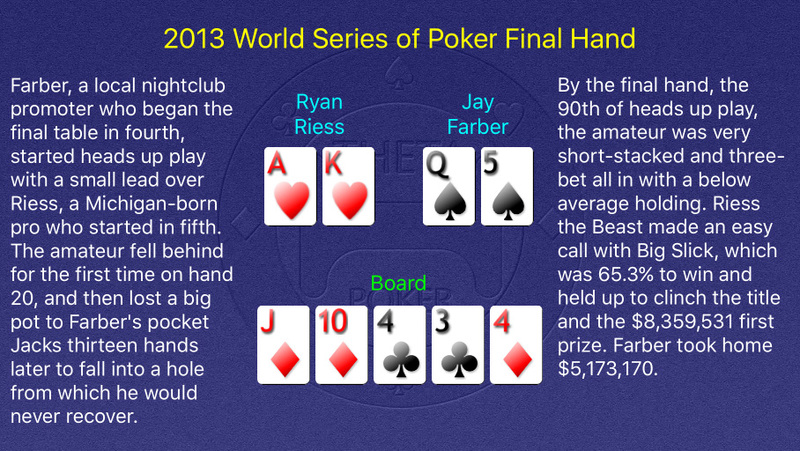 The remaining players, dubbed the November Nine, would do interviews, gather sponsorships, and even play more poker, while ESPN aired weekly broadcasts of the WSOP leading up to the final table. The delay was a success, and the November Nine has become the standard, even in years when the action actually resumed in October. 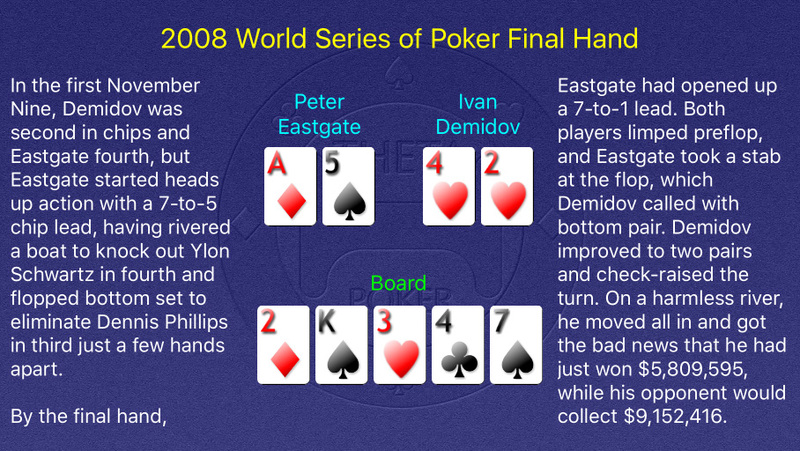 Eastgate became the youngest WSOP Main Event winner at 22 but officially retired from being a full-time poker pro in July 2010. 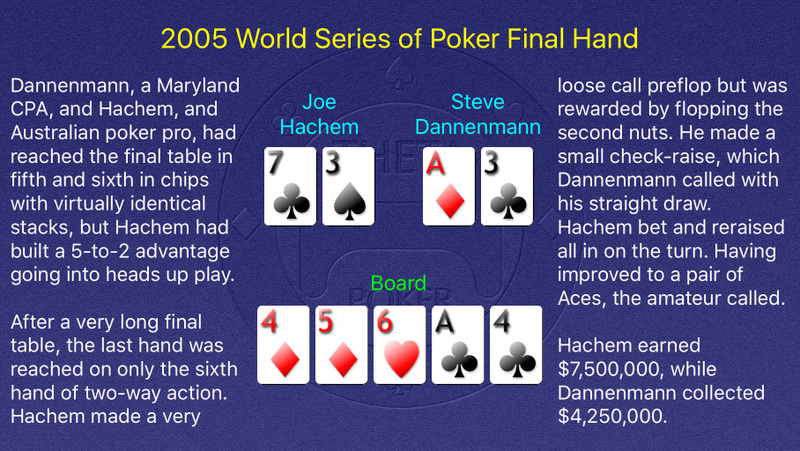 The Dane continues to play occasionally, including a fourth place finish in a 2012 WSOP $1,500 No Limit Hold ‘Em event for $209,111. During Demidov’s break, the Russian reached the final table of the WSOP Europe Main Event, finishing third for $608,995. Yang, not to be confused with the slightly younger founder and former CEO of Yahoo!, had only learned to play poker two years earlier. He donated 10% of his first prize to Make a Wish Foundation, Feed the Children, and the Ronald McDonald House. He has since cashed six times at the WSOP but has not made any more deep runs. Lam had two prior cashes at the WSOP but has not made the money since, preferring online and live cash games to tournament play. 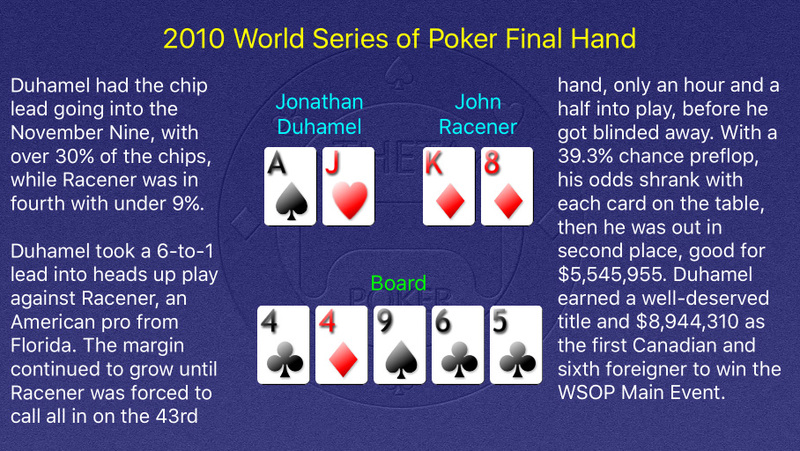 Gold, who had taken lessons from Johnny Chan, was the most experienced player at the final table besides Allen Cunningham. Gold had worked with Crispin Leyser to recruit celebrities to play in the Main Event for Bodog. Gold was given an entry into the tournament for his work and had promised Leyser half of his winnings for his help. Although Gold initially denied the agreemeent, he and Leyser quietly settled their dispute out of court the following February. 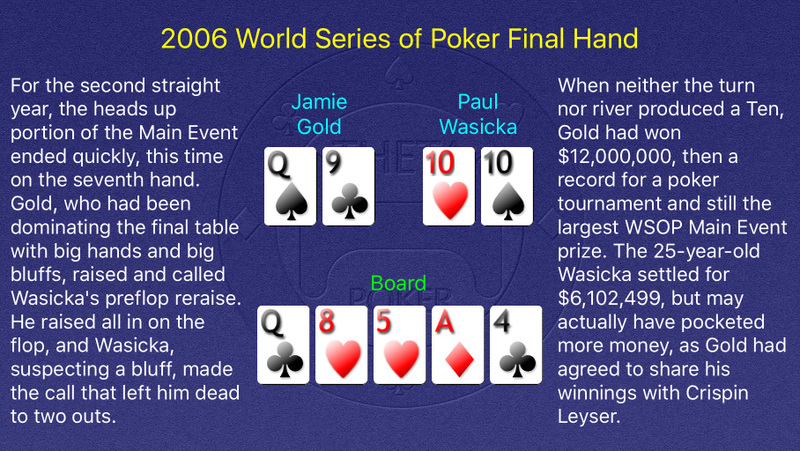 Wasicka has never won a WSOP bracelet but captured the 2007 NBC National Heads-Up Poker Championship for $500,000. Although the WSOP had moved to the Rio, the Horseshoe hosted the last three tables of the Main Event one last time. At the final table every player would earn a seven-figure payday. Mike Matusow got most of his chips in preflop with pocket Kings only to run into Scott Lazar’s Aces. A beautiful King came on the flop, but runner-runner hearts crippled the Mouth, who would soon exit in ninth place for exactly a million dollars. Hachem won a WPT title in 2006 at the Five Diamonds Poker Classic, earning him $2,207,575. Dannenmann claimed that he was only “the fourth best player in his home game” and did not quit his job after his huge payday. Raymer, known as “Fossilman” for his collecting hobby, was named the 2012 Heartland Poker Tour Player of the Year after winning a tour-record four tournaments. 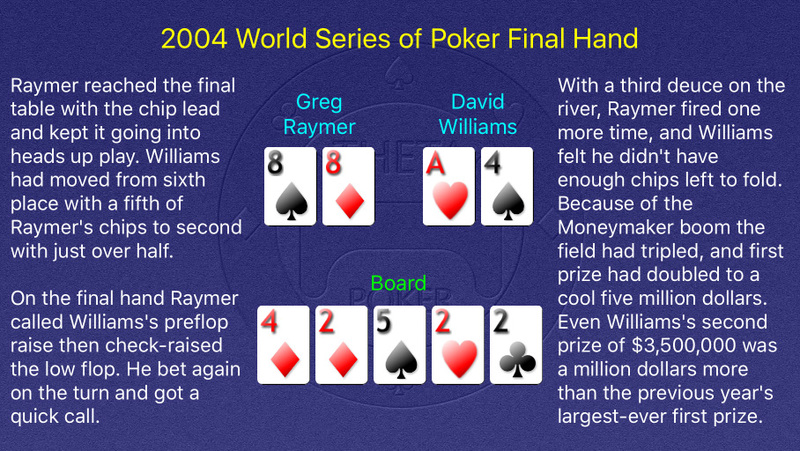 Williams, who would have become the youngest Main Event champion at age 23, went on to win a WSOP bracelet in a 2006 $1,500 Seven Card Stud event. His biggest win was the 2010 $25,000 WPT World Championship, which earned him $1,530,537.